The RNP type defines the total system error (TSE) that is allowed in lateral and longitudinal dimensions within a particular airspace. The TSE, which takes account of navigation system errors (NSE), computation errors, display errors and flight technical errors (FTE), must not exceed the specified RNP value for 95 percent of the flight time on any part of any single flight. RNP combines the accuracy standards laid out in the ICAO Manual (Doc 9613) with specific accuracy requirements, as well as functional and performance standards, for the RNAV system to realize a system that can meet future air traffic management requirements. The functional criteria for RNP address the need for the flightpaths of participating aircraft to be both predictable and repeatable to the declared levels of accuracy. More information on RNP is contained in subsequent categories. The term RNP is also applied as a descriptor for airspace, routes, and procedures (including departures, arrivals, and IAPs). The descriptor can apply to a unique approach procedure or to a large region of airspace. RNP applies to navigation performance within a designated airspace and includes the capability of both the available infrastructure (navigation aids) and the aircraft. In this context, aircraft capability refers to the airworthiness certification and operational approval elements (including avionics, maintenance, database, human factors, pilot procedures, training, and other issues). The level of service element refers to the NAS infrastructure, including published routes, signal-in-space performance and availability, and air traffic management. When considered collectively, these elements result in providing access. Access provides the desired benefit (airspace, procedures, routes of flight, etc.). RNP 0.3 represents a distance of 0.3 NM either side of a specified flightpath centerline. The specific performance that is required on the final approach segment of an instrument approach is an example of this RNP level. 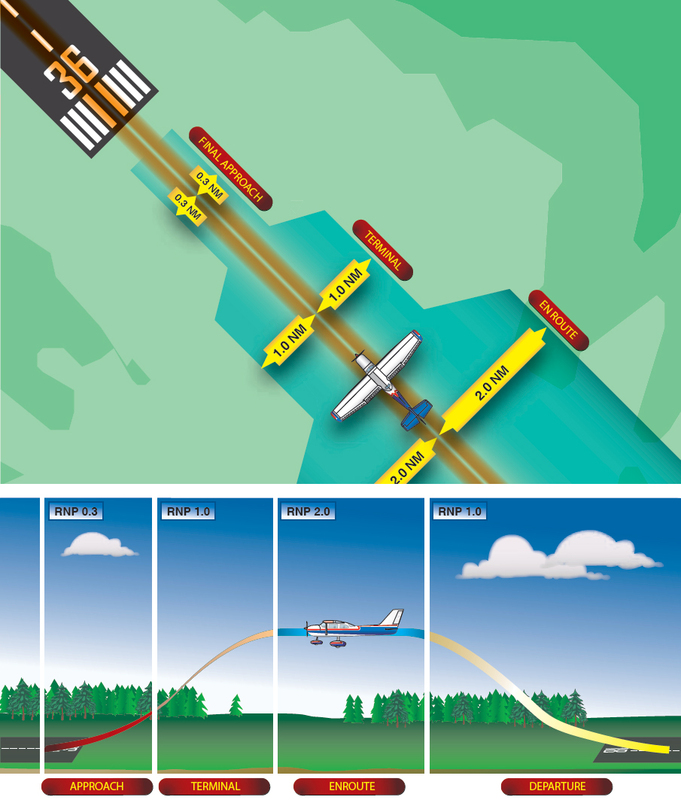 At the present time, a 0.3 RNP level is the lowest level used in normal RNAV operations. Specific airlines, using special procedures, are approved to use RNP levels lower than RNP 0.3, but those levels are used only in accordance with their approved operations specifications (OpsSpecs). For aircraft equipment to qualify for a specific RNP type, it must maintain navigational accuracy at least 95 percent of the total flight time.